It's no mystery why John Riggio, born in Montgomery, West Virginia, and raised in Charleston, became interested in music. "My parents were both musicians," he explains. His father taught at the West Virginia Institute of Technology and was conductor of the West Virginia Opera Theater, while his mother was Dean of the Charleston Conservatory of Music and Fine Arts and first chair horn with the Charleston Symphony. Consequently, he was exposed to many rehearsals and concerts from an early age. "Pop always told us never to go into music," he smiles. "Nobody really listened to him." In fact, all four of John's siblings are involved with music today. When John graduated from the University of Charleston with a double major in music and religion and philosophy, jobs were scarce. His sister and brother-in-law, Teresa and Paul Jennings, suggested John come work for their fledgling music publishing company, Plank Road Publishing. So in 1991, John moved to Milwaukee and took a "temporary" summer job at Plank Road. "I've been here ever since," he laughs. He started out working in the Shipping Department, but Teresa and Paul were impressed by his keyboard compositions and invited him to write a song for Music K-8. His first song for the magazine, "Christmas Day," appeared in Volume 4, No. 2. Since Volume 5, No. 1, he's contributed to every issue. "It's a cool thing that we do here," says John. "I like to be a part of it." John goes to special lengths to make his music appeal to kids. "I always like it to be fun and educational." He sees himself as the "resident rocker" at Plank Road Publishing, though he writes in other styles, as well. 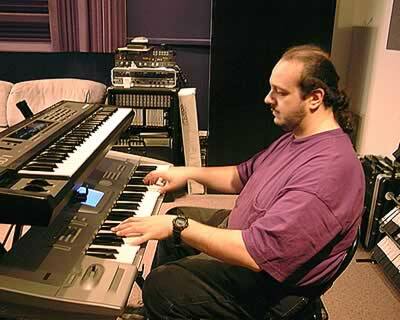 His interest in keyboards is apparent in much of his music. You may notice humorous sound effects in his tunes, such as the heavy equipment used in the construction of the "Chocolate Sundae" or the rocket blasting off in "Rap Of The Solar System." "If a song is funny, it'll grab a kid's attention," says John. Once you have a child's attention, it's easier to teach, which is one of his goals. Many of John's songs are cross-curricular, dealing with science, math, technology, or animals. John also writes recorder tunes, again, usually in a rock style. While the students' part is eminently playable, the accompaniment is exciting and original. When he's not writing music, John serves as Plank Road's electronic music specialist. Outside work, he is involved in his church band and occasionally performs at weddings and the like. John is happy that his music has an effect on young people. "What I write is sung by thousands of kids around the world. That's an honor." A printable PDF version of the biography is available in our Downloads section.